More mutual fund investors are opting for direct schemes considering lower costs compared with that of indirect schemes. Increasing financial literacy is also helping investors to take informed decisions and invest in fund schemes directly without help of intermediaries. The share of assets under management (AUM) of direct schemes increased to 14% at the end of March 2017 quarter from 4.2% in the March 2014 quarter, according to data from Value Research, an online mutual funds research firm. An investor can invest in an equity scheme through two options: direct and regular. In the direct scheme, an investor herself does everything associated with the investing of a scheme. In regular scheme, there is an intermediary in the form of an advisor or distributor who recommends schemes and does the documentation and other miscellaneous works for a commission, which is 0.75-1.25% on generated returns. There are two reasons for the shift in investors' preference. One, increasing financial literacy and awareness among investors helps them take wellinformed decision in terms of fund selection. Second, cost saving on com mission. For instance, Franklin India Bluechip's regular scheme has an expense ratio (a fee charged by fund houses for managing investors' money) of 2.21%, while it is just 1.32% for its direct plan. 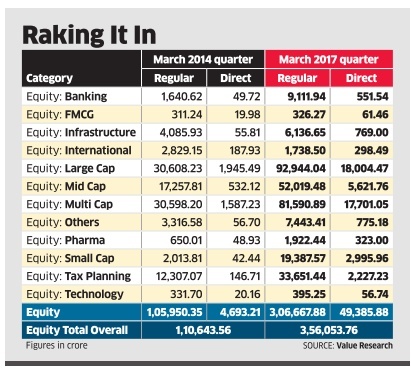 In direct schemes, investors have shown preference for three major themes including smallcap, infrastructure and tax planning schemes.This shows investors who opt for direct schemes are savvy enough to not only gain from tax benefits but also capture early growth stories of smallsized companies.